It is no secret that a beautiful, pleasing, healthy smile can be your most valued physical attribute. After all, people notice your smile first thing. How do you know if your smile is detracting from your appearance? There are many issues that are generally considered to detract from stunning smiles. Missing teeth is a biggie. People who are missing teeth in the back of the mouth may mistakenly believe that the gap doesn’t show. They are usually wrong. When smiling, talking, laughing, or eating, a missing tooth definitely shows – even if the missing tooth is the very last molar. If you want an objective aesthetic evaluation of your smile, how can you do this? You can’t see your smile from every angle when you look in the mirror. 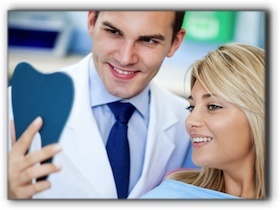 If you want an expert opinion on the attractiveness of your smile, talk to a cosmetic dentist. There are a surprising number of design principals that are used in smile makeovers. These include size, shape, alignment, proportion, color, and translucency. Moreover, cosmetic dentists also consider the characteristics of the gums, lips, and facial features. Cosmetic dentistry is an essential topic that we like to address. We offer a full menu of cosmetic dentistry services. Ask us about dental implants, teeth whitening, veneers, dental crowns, and tooth-colored fillings. We hope to educate Dallas residents on what these procedures are and how they can help you to get the beautiful smile that you’ve always wanted.